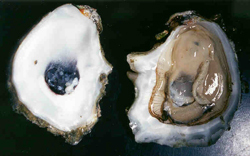 Native oysters were once abundant in Willapa Bay and Puget Sound, but were overharvested in the late 1800's. Despite large state reserves set up to protect the remaining stock, populations have remained small. Surprisingly, we have discovered that large quantities of native oyster larvae set each summer, but only a small number of these survive. We are currently conducting several projects to explore the factors effecting post-settlement survival including substrate modification, competition, and settlement sinks. 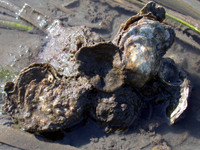 Pacific oysters were introduced to Willapa Bay from Japan after several attempts to introduce other species failed. They are now naturalized and are the basis for a booming oyster industry. 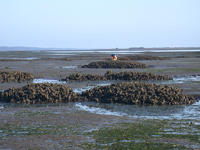 We are using pacific oysters to explore the spatial variation in secondary productivity across the bay. In addition, we are exploring the interactions between the different aquaculture techniques (longlines, dredged, hand picked) and eelgrass. 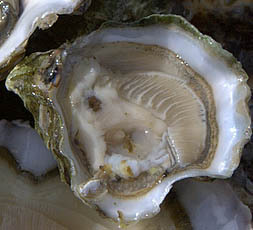 Eastern oysters were introduced to Willapa Bay after the depletion of the native oyster stock. They were shipped by rail from the East coast in crates padded with Spartina. 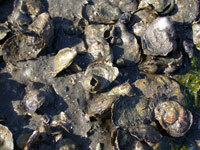 European Flats were also introduced to Willapa Bay after the depletion of the native oyster stock. They can still be found in very small numbers around the bay. Recently, the oyster growers of the Pacific Northwest have started culturing Kumamotos - a small, deeply cupped oyster popular as a shooter.